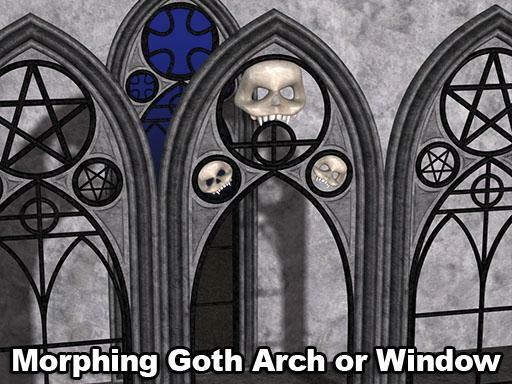 The Morphing Gothic Window/Arch is a figure for use in Poser or Daz Studio. As the title suggests, you can use it as either a free-standing arch or as a window. It comes into Poser or Daz Studio as a window with a surrounding wall. All the morphs are designed to show or hide various geometry parts. It works best to set the morphs to either 0 or 1 for Poser, 0% or 100% for Daz Studio. See the ReadMe file included in the download zip file. Thank you so very much!!!! Wonderful for my "studio" sets! Wow, thanks; I've been looking for something like this! 3 years and still going strong :) This is beautiful, and really fills a need for me right now - belated thank you!!! I love this,stunning for wiccan renders. Webtigress (11 years ago) Inappropriate? That is looking f...ing great and fills a need. Contributions like this do encourage me to send in more freebees.